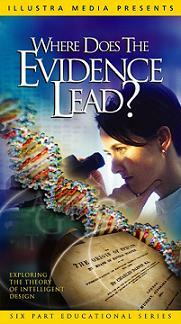 Where Does The Evidence Lead? is a re-cap, summarization of all the materials included in the Unlocking The Mystery Of Life production. It's an incredibly "easy-to-view" and "easy-to-understand" video! Where Does The Evidence Lead? is divided into six, 10-minute chapters that allow the viewer to quickly view and fully grasp the compelling case for "Design vs Darwinism." Part 1 LIFE: THE BIG QUESTIONS A new challenge to the theory of natural selection. Part 2 WHAT DARWIN DIDN'T KNOW Exploring the complexity of the living cell. Part 3 MOLECULES & MOUSETRAPS Molecular machines that defy Darwin's theory. Part 4 HOW DID LIFE BEGIN? Why "chance" cannot explain the origin of life. Part 5 THE LANGUAGE OF LIFE DNA genetic information, and life on Earth. Part 6 THE DESIGN INFERENCE The scientific evidence for intelligent design. This is a must-have for all home-schoolers or for anyone who wants to learn more about the argument for a created universe. Purchase Where does the evidence lead? This page was last modified on 15 July 2009, at 22:07.